A photograph of a citizenship class held at Neighborhood House in Louisville, Kentucky, ca. 1930s. Neighborhood House, established in 1896, was the first settlement house in Kentucky and is still in operation today. 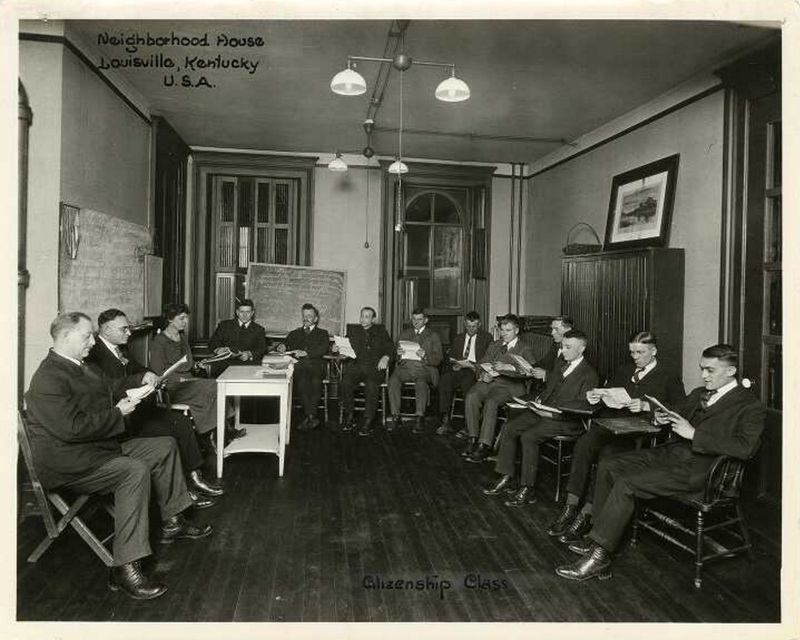 “Citizenship class at Neighborhood House settlement in Louisville, Kentucky,” Digital Public Library of America, http://dp.la/item/7ba46f4d0bc991b563389059f57e74f6. A photograph showing early leaders of the settlement house movement, ca. 1900s. A map of ethnic groups in a Chicago neighborhood served by Hull House, 1895. Excerpts from a weekly schedule of lectures, clubs, and classes at Hull House in Chicago, 1892. Excerpts from The City Wilderness: A Settlement Study, written by “residents and associates” of South End House in Boston, 1898. A fundraising brochure for the Los Angeles Settlement House, sponsored by the Rotary Club of Los Angeles, ca. 1910s. Excerpts from the 1920 Annual Report of the Unity Settlement Association in Minneapolis, Minnesota. A photograph of a group outside Palama Settlement in Honolulu, Hawaii, 1909. A photograph by Lewis Hine of the singing class at Hull House in Chicago, 1910. A photograph of a group of girls in gym class at Settlement Home in Atlanta, Georgia, 1903. A photograph of children reading in the Mulberry Settlement House library, New York City, 1920. A page featuring photographs of the play facilities and children served by Social Settlement in Washington, DC, 1905. A photograph of a settlement house kindergarten in Chicago, Illinois, 1901. A photograph of a group of adults and children outside Brownson House in Los Angeles, California, 1919. A photograph of the Phyllis Wheatley Settlement House football team, Minneapolis, Minnesota, 1929.